Chicken Meal, Beef Meal, Lamb Meal – SAY WHAT! I teach a few dog training classes at a local petstore so I am around people a lot shopping for food for their pets. I hear people all the time say this food isn’t good because it has Chicken Meal in it. So I wanted to educate in case their are a few people that didn’t understand what “meal” meant. As with human food, dog food ingredients are listed the same way, ingredients are listed in order of % it makes up in the food. Ingredients listed first are what is the majority in the food and as you go down in the list those ingredients make up less of the food. 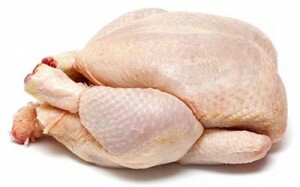 Food that list chicken (or any other meat source) first means that Chicken is the main ingredient but that is while it still contains all the water that makes up any meat. If it says Chicken Meal that means the chicken has been dehydrated first before adding it to the food. So dehydrated chicken is going to be more concentrated in protein and nutrients than just chicken because all the water has been removed. So a general rule of thumb is chicken meal is actually better than just chicken.